Syria’s civil war attracted tens of thousands of men and women from around the world. By 2014, their most popular destination was the so-called Islamic State of Iraq and Syria (ISIS), which attracted more foreign fighters than any Salafi-Jihadist group in history. In the past year, various coalitions of Kurdish, Iraqi, Syrian, American and other international forces have retaken the vast majority of ISIS-controlled territory. As ISIS lost territory, it also lost its ability to attract foreign fighters. Nevertheless, the question remains: Why did so many leave their homes and travel hundreds or thousands of miles to join ISIS? This study tries to answer that question in North Africa and the Arabian Peninsula by examining data on over 1,800 ISIS fighters who came from these regions, two of the most significant recruiting grounds for ISIS, in 2013 and 2014. When these individuals enlisted with ISIS, they filled out enrollment forms that included personal questions such as age, employment history and educational background. We analyze those forms in conjunction with census data, records of protest and other sources on previous terrorist recruitment efforts. Terrorist attacks inspired by ISIS and similar groups remain a pressing worry around the world. As a result, a clear understanding of why these recruits joined ISIS remains vital to countering the continued jihadist terrorist threat. Ascertaining human motivation for participation in terrorism is complex: Decades of research has found no single rationale that can explain why individuals join terrorist groups. However, our analysis finds patterns of ISIS recruitment that start with the local communities that foreign fighters came from. North Africa and the Arabian Peninsula had distinct patterns of ISIS mobilization. Fighters from North Africa were socioeconomically underprivileged and came from regions characterized by a lack of access to economic and political power. Meanwhile, ISIS fighters from the Arabian Peninsula were relatively better off and came from regions with closer links to political elites. Grand theories on the causes of radicalization miss essential local differences. 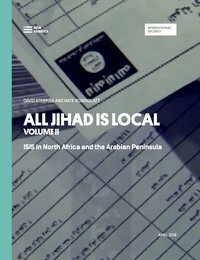 While regional patterns exist, jihadist recruitment draws upon specific local dynamics that vary even within the two regions examined here. There are no shortcuts to countering the appeal of ISIS and related groups: Local contexts must be properly understood to formulate effective counterterrorism and counter-radicalization responses. The Arab Spring and its aftermath created opportunities for jihadists to organize and mobilize on a wider scale than previously possible. Jihadists quickly organized in the aftermath of the Arab Spring of 2011, creating the foundations for ISIS’ mobilization of fighters enmasse. Libya and Tunisia, where governments fell during the Arab Spring, produced more fighters per capita than Morocco and Algeria, where governments survived local protests. Eighteen of the top 20 provinces ISIS fighters came from in North Africa were in Libya or Tunisia. In Tunisia, ISIS built upon local Salafi-Jihadist recruiting networks like Ansar al-Sharia, which took advantage of the post-Ben Ali environment of political openness to openly promote jihad. Tunisian ISIS fighters often listed Ansar al-Sharia’s leaders as having recommended them to join ISIS. In Libya, jihadists were able to operate and recruit openly amid the patchwork of militias that emerged following Ghaddafi’s fall. More than half of Libyan ISIS fighters reported having prior experience in jihadist conflicts, almost entirely in Libya. Most provinces in North Africa with high rates of ISIS fighter recruitment were economically and politically marginalized. They had high rates of underemployment, lack of political representation and poor access to social services compared to their national contexts. The geographic origins of ISIS recruits from North Africa suggest the group took advantage of long-standing frustrations in marginalized communities to mobilize fighters. Derna (Libya) and Kebili (Tunisia) were the two provinces in North Africa with the highest rates of ISIS fighters. Nearly three-quarters of fighters from these provinces reported little or no employment. Provinces in North Africa where fighters reported the least reliable employment had the highest rates of ISIS recruitment. There is a negative correlation between the quality of employment and the number of ISIS recruits in the top 20 per capita fighter-producing provinces in North Africa. More than eight in 10 of ISIS’ foreign fighters from Libya came from the country’s eastern region. Eastern Libya suffered from higher underemployment than Libya’s west, was excluded from patronage networks under Muammar Ghaddafi and suffered from poor service provision. Fighters from eastern Libya reported worse employment situations than fighters from western Libya. The issue of marginalization is particularly acute in Derna, which had a higher rate of ISIS foreign fighters and whose fighters reported lower economic and educational attainment levels than anywhere else in eastern Libya, including Benghazi. In Tunisia, fighters came at the highest rates from the capital, Tunis, and its suburbs or the southern border areas. Tunisia’s wealthy eastern coast produced fighters at a lower rate than other regions of Tunisia. Around the capital, fighters came disproportionately from economically struggling neighborhoods. The lower-class neighborhood of Ettadhamen, for example, produced fighters at a rate three times that of the rest of the Tunis region. More than half of all fighters from Morocco came from its poorer, less integrated northern provinces, despite this region accounting for approximately one-quarter of the country’s population. ISIS mobilized different types of recruits from the Arabian Peninsula than those who joined jihadist conflicts in the past. Although there have long been Salafi-Jihadists from the Arabian Peninsula, those who joined ISIS were generally new to jihadist conflicts. In Saudi Arabia, ISIS fighters were disproportionately from the Wahhabi heartland of the Nejd, whereas previous sources of jihadists from Saudi Arabia were the cities of Mecca, Medina and Jeddah. People in the region of Nejd are more interested in the social ordering of Islamic societies, which means it is possible that ISIS’ propaganda of building an Islamic State resonated more strongly than al-Qaeda’s notions of geopolitical conflict. Social networks and mobilizations during the 2011 Arab Spring may have also played a role in the disproportionate number of fighters from the Nejd. In Bahrain, Sunni populations were militarized to help end the predominantly Shi’a Arab Spring demonstrations in 2011. Bahrainis joined ISIS at a higher rate than for previous jihadi conflicts in part as a result of this militarization. In Yemen, there were far fewer foreign fighters in the ISIS sample as compared to the number of Yemenis recorded fighting in Iraq or Afghanistan. This is likely for two reasons: first, that the ongoing civil war in Yemen kept would-be ISIS fighters at home; second, that al-Qaeda is more established in Yemen than ISIS. This means that if Yemenis were traveling to fight in Syria, they were more likely to join the al-Qaeda affiliate, Hay’at Tahrir al-Sham, than ISIS. Regions in the Arabian Peninsula with disproportionate numbers of ISIS recruits had larger proportions of young people (ages 15-24) than normal for their respective countries. Youthfulness was the most substantial positive correlation that this study found among hot spots of recruitment in the Arabian Peninsula, which also compared economic well-being and historical rates of jihadist mobilization. Provinces in the Arabian Peninsula with high rates of ISIS fighters were traditionally close to their country’s ruling elites. Though individual fighters from these regions might have been worse off in comparison to the general population, as a whole they did not come from marginalized communities. The proximity of regions in the Arabian Peninsula with high rates of ISIS foreign fighters to political elites may partially explain the reluctance of local governments to prosecute ISIS recruits during the first few years of its existence. Saudi Arabia, Bahrain and Kuwait did not crack down on ISIS recruitment in their own territories until 2015, when high-profile attacks threatened their domestic security. The root causes that led to ISIS’ rise remain unaddressed in the Arabian Peninsula, which raises the specter of a renewed foreign fighter mass mobilization in the future. Instead of debating which theory best explains ISIS mobilization, analysts should focus on where different theories have the most explanatory value. The debate over which theory best explains why people join terrorist groups has produced little consensus over four decades and is of little use to practitioners. We advocate an approach that first determines where recruits are coming from before assessing what might motivate them. Economic growth and political inclusion should be security priorities for North Africa. While it will be important to address ISIS’ ideological message in North Africa, ISIS’ mobilization drew upon long-standing conditions of marginalization that are likely to generate new mobilizations in the absence of efforts to expand economic and political inclusion in the region. Addressing the ideological roots of Salafi-Jihadism should be a security priority in the Arabian Peninsula. ISIS’ propaganda resonated among a new cohort of jihadists who utilized elite-level connections to facilitate the recruitment of fighters on a large scale. That these fighters were new to jihad and left the region to fight meant that they were not deemed a threat by the security infrastructure in the Arabian Peninsula. New policy approaches to the region must encourage governments in the Arabian Peninsula to address the ideological roots sanctioning violent religious radicalism and view conflicts that mobilize domestic militants to fight abroad as a serious security threat. While we chose to use the acronym the Islamic State of Iraq and Syria (ISIS), there are many other acronyms used to describe the group: the Islamic State (IS), the Islamic State of Iraq and the Levant (ISIL), Daesh (an acronym of the group’s Arabic name). We use the term Salafi-Jihadism to refer to groups and individuals that seek to bring about, through violence, an emulation of the practices of the first three generations of Islam. The term is shortened to “jihadism” in this paper for readability purposes. This draws from Shiraz Maher, Salafi-Jihadism: The History of an Idea (London: Hurst, 2016). When this paper uses other terms, it is to deliberately broaden the scope of analysis. For example, violent religious radicalism includes other non-state armed groups in the region that advance anti-normative agendas primarily through violence; Islamism refers to organizations that seek to transform states and societies according to Islamic law, either through violence or strictly political means; and Salafism can refer to groups of people who try to bring about the emulation of practices of the first three generations of Islam, whether through violence or not.